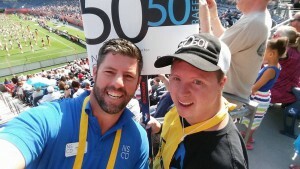 The National Sports Center for the Disabled (NSCD) will be hosts a 50/50 Raffle at all Denver Broncos home games, as well as other special events. This game-day fundraiser provides fans the opportunity to purchase raffle tickets before and during all Broncos home games. One lucky fan will go home with half of the net proceeds and the other half will be donated to the NSCD and Denver Broncos Charities. Don’t miss this chance to win big and support a good cause! 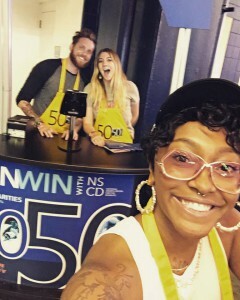 To purchase raffle tickets, fans can look for NSCD 50/50 sellers in bright yellow aprons with handheld devices around the parking lots at Broncos Stadium at Mile High and during the game inside the stadium. 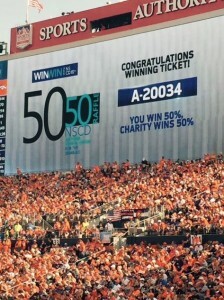 If you are in the area of Broncos Stadium at Mile High, you are also able to purchase raffle tickets online here. An update of the jackpot amount will be posted on kiosks and Thundervision throughout the game.You can also view the current jackpot amount here. Sales begin approximately three hours before kickoff in the parking lots and two hours before kickoff in the stadium and continue through the end of the third quarter. The winning number will be posted within 24 hours of the drawing. The Winner has 30 days from the date of the raffle to claim their prize. Please click here or call 303-633-5806 for the winning number or questions. Winner need not be present to win. Upon proof of winning ticket, the winner will receive their earnings via check or electronic transfer within 10 business days. 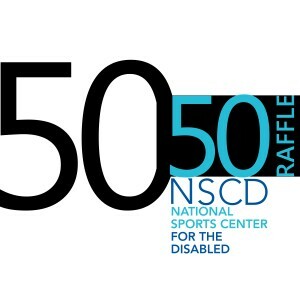 If you would like to volunteer as an NSCD Raffle Volunteer click here to SIGN UP for specific dates. The NSCD is one of the largest outdoor therapeutic recreation agencies in the world. Each year, thousands of children and adults with disabilities take to the ski slopes, mountain trails and playing fields to learn more about sports and themselves. With specially trained staff and its own adaptive equipment lab, the NSCD teaches a variety of sports and activities to individuals with almost any physical, cognitive, emotional or behavioral diagnosis. For more information about the NSCD visit our website at nscd.org or like us on Facebook for updates about our programs and athletes. 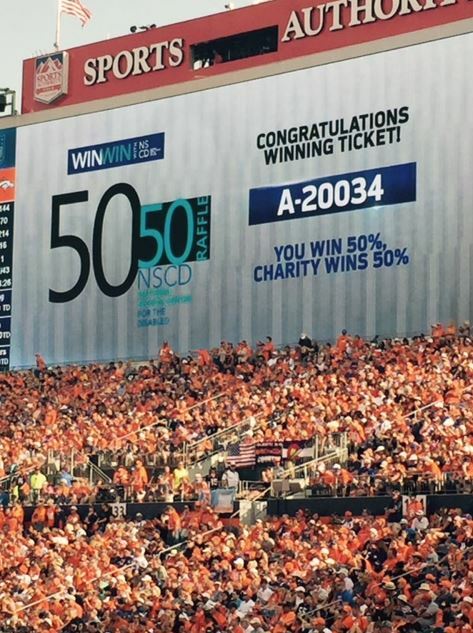 The Denver Broncos are committed to improving lives in our communities. In keeping with this mission, the Broncos have developed programs and partnerships with specific organizations in Colorado that can grow over time and make the largest possible impact. Be a Champion in the Community!